Originating from an area around Mexico, the butternut squash has proven itself to be a popular vegetable with both chefs and gardeners alike. Roasted, toasted or mashed into soups, casseroles or breads the butternut squash is extremely versatile, and so it’s no wonder that it is becoming an increasingly common find in our vegetable gardens and allotments. 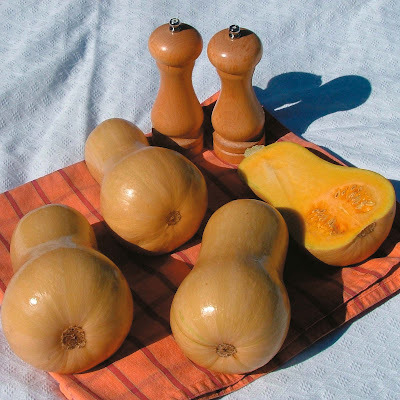 Growing butternut squash from seed is a relatively simple affair as the resulting seedlings are normally quite vigorous. You could of course prepare and save the seed from supermarket bought specimens but if you live in a northern European climate you will need to grow varieties that can cope with our comparatively shorter growing period. In recent years there have been several trials to find out which varieties perform best with regards to vigour, flavour, and cropping. In fact the Royal Horticultural Society have completed their own trials and have recommend the AGM (Award of Garden Merit) to the cultivars ‘Hunter’, 'Cobnut’, ‘Harrier’ and ‘Hawk’. You should begin sowing in May using 3 inch pots filled with the bottom inch or so filled with in a good quality John Innes seed compost, but if you have a tendency to over-water then you may wish to add a handful of horticultural grit to the mix to improve the drainage. Take one seed and place it either on its side, or with the pointed end down, then fill the pot to within 1 inch of the top with more of the compost mix. Water in and then place your pots onto a warm, sunny windowsill. The seedlings should emerge within 7 – 10 days. Now these new plants will grow pretty fast from this point and so it’s important that they don’t dry out – they will probably need watering every 2-3 days, but make sure that they don’t become water-logged otherwise fungal rots could appear. Even at this stage you can consider feeding ½ the recommended dosage of an appropriate liquid fertiliser. 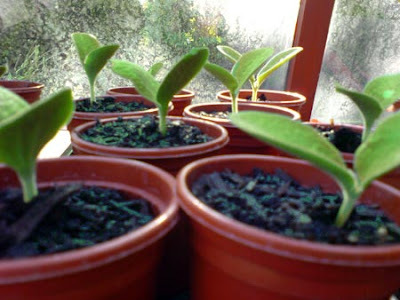 After about four weeks on from sowing, your squash seedlings should be ready to go outside, but they will need to be hardened off for a week or two before being left in their permanent position. You have two choices at this point. So long as the threat of late frosts are over you can either plant directly into the ground or – if you are short of space – plant into large containers, but when it comes to butternut squash, the larger, the better!